codes_principaux.pdf A description of the Bendix-Lockheed part numbers. 1 page. correcteurs.pdf A list with brake limiters and associated part numbers. Comes with exploded view drawings. 2 pages. coupelles.pdf A list with many brake cups and dust rubbers. All listed with sizes, part numbers and drawings of the products. 16 pages. cylindres.pdf A list with brake and clutch cylinders with description and part numbers. No images though. For many French cars. 20 pages. flexibles.pdf A list with picture, sizes and part number of flexible brake hoses. The thread is also in the description. 24 pages. necessaires.pdf A list of which part you need in certain brake cylinders. Comes with part numbers. 24 pages. necessaires2.pdf A similar list as above, but only 3 pages. nivocodes.pdf Level switches or brake light switches? 1 page. raccords.pdf A long list with brake hose connections. Parts numbers, drawings and description of thread. 39 pages. reservoirs.pdf All sorts of plastic and glass brake fluid reservoirs for our vintage French cars. With drawings and part numbers. 11 pages. 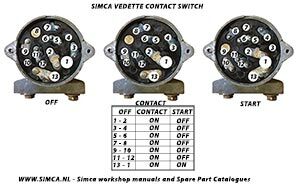 simca.pdf A extended list with brake parts for our 50s and 60s Simcas. Comes with a handy diagrams where which part is located. 38 pages. Simca-accessory.pdf Original accessory for your Simca, complete with Dutch 70s lady. For sale at your Simca dealer. In Dutch language. 8 pages 3.3Mb. Hirondelle-1965.pdf Hirondelle, an official Simca magazine published by Simca Netherlands for their customers. This copy is the second issue of 1965. 40 pages, 5Mb. PR-book-1950s.pdf A Simca PR book from 1957. About several Simca activities. An interesting book. 23 pages. 30Mb. More freebees to follow here.